Glaciers, ice sheets and ice caps cover around 11% of the earth’s land surface. At least 50% of the beds of these ice masses have temperatures at melting point due to the high pressure beneath the weight of the ice masses (Oswald and Gogineni, 2012). Liquid water is therefore present at the ice-bedrock interface in these areas. Additionally, erosion is a frequent feature of larger ice masses, and involves crushing and fracturing of bedrock. Consequently, recently crushed and wetted rock is a common feature of glacier and ice sheet beds. The adage that “where there is water, there is life” holds true for all glacier beds sampled to date, and for the only subglacial lake directly sampled beneath Antarctica, Subglacial Lake Whillans. Still, there is a large spectrum of different aquatic subglacial habitats beneath glaciers and ice sheets. The subglacial environments host genetically and functionally diverse microbial ecosystems capable of accelerating rock weathering (Montross et al., 2013), influencing global carbon cycles (Wadham et al., 2012) and productivity in adjacent oceans (Death et al., 2014). How long can life survive beneath large ice masses? However, the maintenance and longevity of these ecosystems is currently an area of uncertainty. Subglacial debris contains chemicals such as sulphides and organic matter that provide energy to sustain subglacial life (Hamilton et al., 2013). This is particularly important in areas close to the margin where melting water from the surface enters through moulins and crevasses and transports O2 and other biologically useful compounds such as DOC (dissolved organic carbon), POC (particulate organic carbon) and nutrients (such as Nitrogen and Phosphorus) to the bed. However, in the interior zones of ice sheets, the direct input of these species to the bed is negligible because hydrological connections between surface and bed do not exist. The O2 that is added to the bed in these locations is limited to gas bubbles in the basal ice which is geothermally melted or melts as regelation waters form and refreeze as ice flows around irregularities of the bedrock . This is problematic for the longer term maintenance of life in subglacial lakes and other aquatic environments beneath the ice sheet interiors, such as swamps and ice stream beds, because there is a lack of dissolved oxygen, and there is little energy derived from oxidants interacting with organic matter and sulphides. 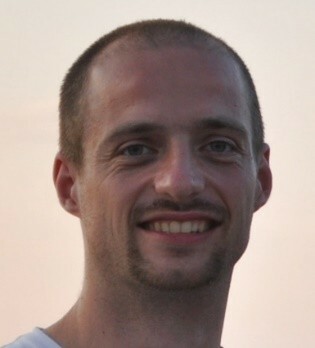 Further, the supply of potentially reactive organic matter, for example within former marine sediments, is finite and decreases over time, Therefore, subglacial life beneath ice sheet interiors is destined to expire unless new and sustainable sources of energy can be generated at the bed. Hydrogen seems to be the miraculous diet! A major advance in our understanding of the maintenance of life in subglacial environments was the recent discovery that H2 is produced by subglacial crushing. This is an important energy source for microbial food chains, because physical energy is transferred, via surface chemical (free-radical) energy, to biological activity and energy. Experiments show that around 10-20 nmol H2 is produced per gram of crushed rock after 120 hours (Telling et al., 2015). Even if they sound very small, these concentrations are significant since only sub-nanomolar concentrations of H2 are required to sustain microbial growth near 0°C (Hoehler, 2004). Hydrogen is utilized by many types of microbes, and is generated abiotically via the interaction of silica surface radicals with water. 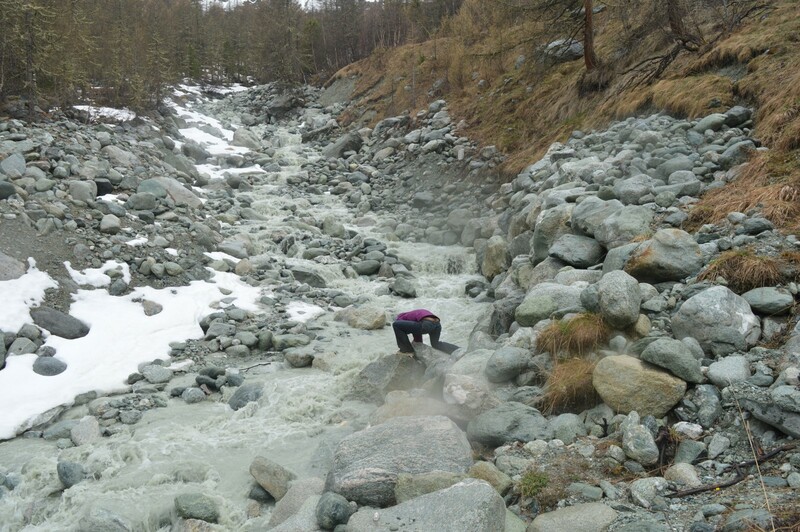 Next time you look at an otherwise dull grey meltwater stream draining a glacier, think of the crushing and the hydrogen that has been liberated by glacier erosion. 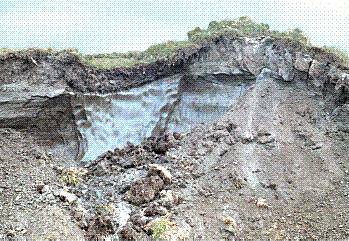 The grey coloration arises from suspended sediment concentrations of about 1kg/m3 of meltwaters, and the sediment is typically silt- to clay-sized [Credit: Martyn Tranter]. Production of H2 supports the base of microbial food webs in fault and hydrothermal zones. Therefore, it is no stretch to suppose that this could be the case beneath glaciers. The H2 production rate from experimental rock crushing exceeds that required to support measured rates of methane production in the upper centimetre of South Western Greenland subglacial sediments. Additionally, rates of methane production in these subglacial sediments increased 10 times with the addition of excess H2 at 1°C (Stibal et al., 2012). A range of aerobic and anaerobic bacteria thought to be capable of oxidizing H2 as a source of energy have been found in subglacial sediments. 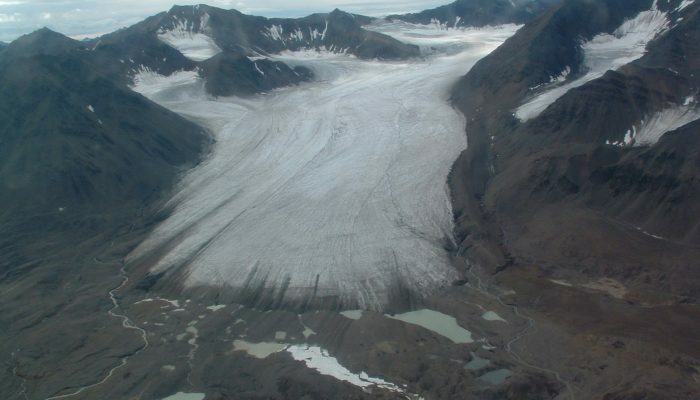 Adding H2 to subglacial sediments from Robertson Glacier provided compelling evidence that the non-biological H2 produced during rock crushing could provide the sustain H2-oxidizing microbes (Telling et al., 2015). Subglacial Lake Whillans is the first Antarctic subglacial lake to be sampled via a direct access hole. Water and sediment from the lake contain microbial life (Christner et al., 2013). Examination and experimentation on these unique samples is currently ongoing at the University of Bristol, where we hope to show that even already heavily weathered sediment produces hydrogen and supports microbial ecosystems when crushed and wetted. Subglacial microbes really do have a crush on glacier erosion, but don’t say it with chocolate or flowers, say it with hydrogen. 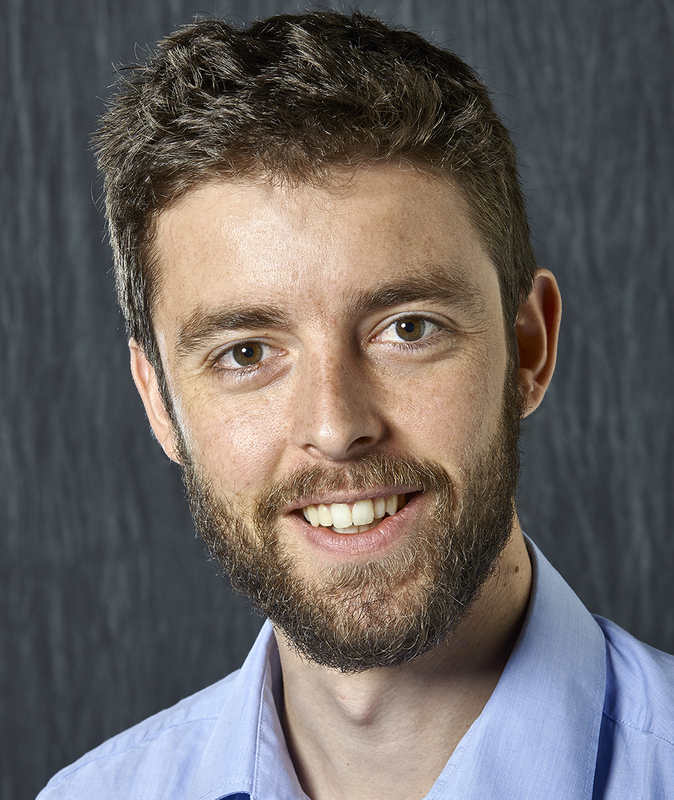 Martyn Tranter is a polar biogeochemist, resident at the Bristol Glaciology Centre, University of Bristol, UK. Contact Email: m.tranter@bristol.ac.uk. Fig. 1: Schematic representation of major changes in the Arctic regions caused by global warming [Credit: Fig. 1.2 of AMAP (2017), adapted from US National Center for Atmospheric Research (NCAR)]. The Arctic is changing rapidly and nothing indicates a slowdown of these changes in the current context. The Snow, Water, Ice and Permafrost in the Arctic (SWIPA) report published by the Arctic Monitoring and Assessment Program (AMAP) describes the present situation and the future evolution of the Arctic, the local and global implications, and mitigation and adaptation measures. The report is based on research conducted between 2010 and 2016 by an international group of over 90 scientists, experts, and members of Arctic indigenous communities. As such, the SWIPA report is an IPCC-like assessment focussing on the Arctic. Our Image of the Week summarizes the main changes currently happening in the Arctic regions. What is happening to Arctic climate currently? The SWIPA report confirms that the Arctic is warming much faster than the rest of the world, i.e. more than twice the global average for the past 50 years (Fig. 2). For example, Arctic surface air temperature in January 2016 was 5°C higher than the average over 1981-2010. 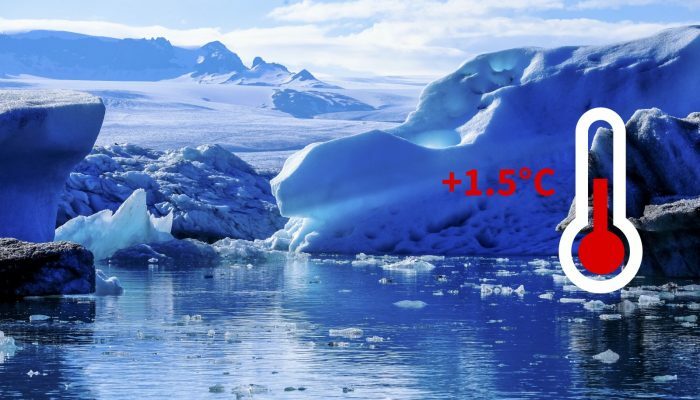 This Arctic amplification is due to a variety of climate feedbacks, which amplify the current warming beyond the effects caused by increasing greenhouse gas concentrations alone (see the SWIPA report, Pithan & Mauritsen (2014) and this previous post for further information). Fig.2: Anomaly of Arctic and global annual surface air temperatures relative to 1981-2010 [Credit: Fig. 2.2 of AMAP (2017), revised from NOAA (2015)]. This fast Arctic warming has led to the decline of the ice cover over both the Arctic Ocean (sea ice) and land (Greenland Ice Sheet and Arctic glaciers). For sea ice, not only the extent has dramatically decreased over the past decades (see Stroeve et al. 2012 and Fig. 3), but also the thickness (see Lindsay & Schweiger, 2015). Most Arctic sea ice is now first-year ice, which means that it grows in autumn-winter and melts completely during the following spring-summer. In contrast, the multiyear sea-ice cover, which is ice that has survived several summers, is rapidly disappearing. Fig. 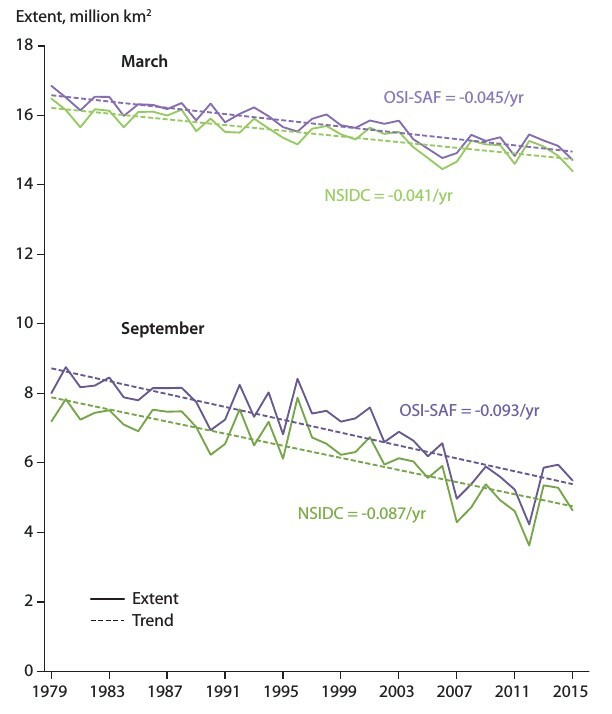 3: Arctic sea-ice extent in March and September from the National Snow and Ice Data Center (NSIDC) and the Ocean and Sea Ice Satellite Application Facility (OSI SAF) [Credit: Fig. 5.1 of AMAP (2017)]. In terms of land ice, the ice loss from the Greenland Ice Sheet and Arctic glaciers has been accelerating in the recent decades, contributing a third of the observed global sea-level rise. Another third comes from ocean thermal expansion, and the remainder comes from the Antarctic Ice Sheet, other glaciers around the world, and terrestrial storage (Fig. 4, see also this previous post and Chapter 13 of the last IPCC report). Fig. 4: Global sea-level rise contribution from the Arctic components (left bar), Antarctic Ice Sheet and other glaciers (middle-left bar), terrestrial storage (middle-right bar) and ocean thermal expansion (right bar) [Credit: Fig. 9.3 of AMAP (2017)]. Besides contributing to rising sea levels, land-ice loss releases freshwater into the Arctic Ocean. Compared with the 1980-2000 average, the freshwater volume in the upper layers of the Arctic Ocean has increased by more than 11%. This could potentially affect the ocean circulation in the North Atlantic through changes in salinity (see this previous post). Other changes currently occurring in the Arctic include the decreasing snow cover, thawing permafrost, and ecosystem modifications (e.g. 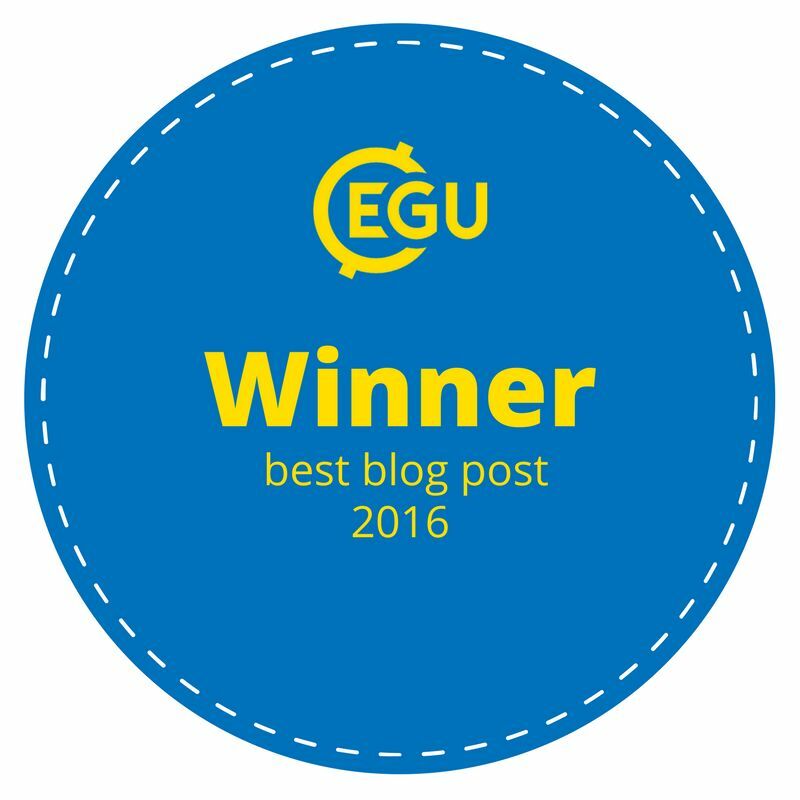 occurrence of algal blooms, species migrations, changing vegetation, and coastal erosion). You can have a look at the main Arctic changes in our Image of the Week. 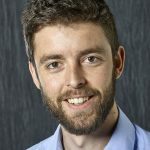 The SWIPA report highlights that the warming trends in the Arctic will continue, even if drastic greenhouse gas emission cuts are achieved in the near future. For example, mean Arctic autumn and winter temperatures will increase by about 4°C in 2040 compared to the average over 1981-2005 according to model projections (Fig. 5, right panel). 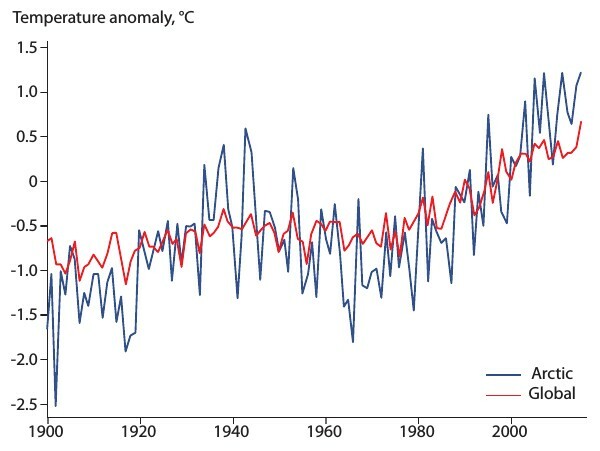 This corresponds to twice the increase in projected temperature for the Northern Hemisphere (Fig. 5, left panel). Fig. 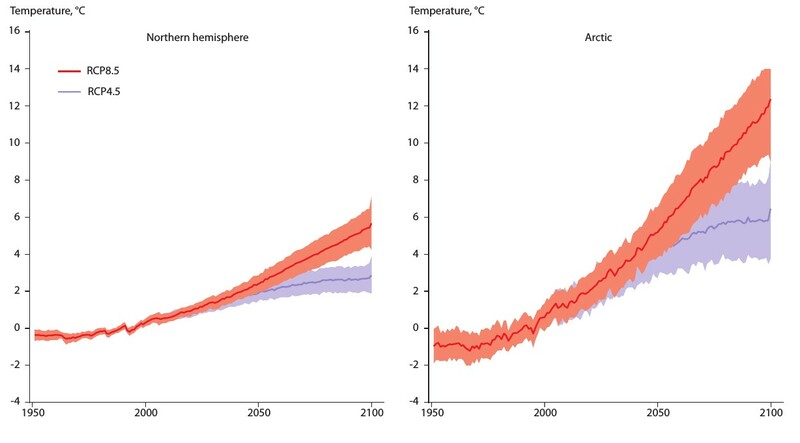 5: Autumn-winter (NDJFM) temperature changes for the Northern Hemisphere (left) and the Arctic only (right) based on 36 global climate models, relative to 1981-2005, for two emission scenarios [Credit: Fig. 2.15 of AMAP (2017)]. 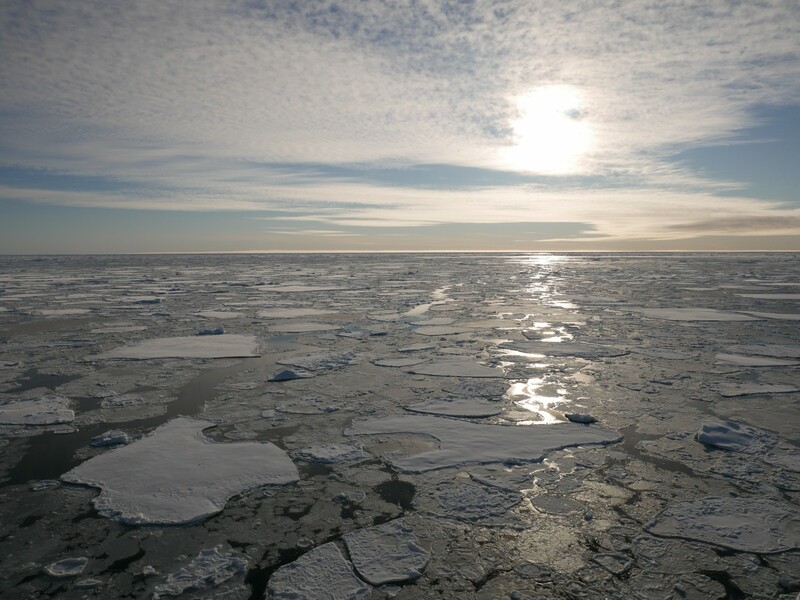 The Arctic Ocean could be ice-free in summer by the late 2030s based on extrapolated observation data. This is much earlier than projected by global climate models. Permafrost extent is projected to decrease substantially during the 21st Century. This would release large amounts of methane in the atmosphere, which is a much more powerful greenhouse gas than carbon dioxide. Mean precipitation and daily precipitation extremes will increase in a warming Arctic. Global sea level will continue to rise due to melting from ice sheets and glaciers, ocean thermal expansion, and changes in terrestrial storage. However, uncertainties remain regarding the magnitude of the changes, which is linked to the different emission scenarios and the type of model used. A potential economic benefit to the loss of Arctic sea ice, especially in summer, is the creation of new shipping routes and access to untapped oil and gas resources. However, besides this short-term positive aspect of Arctic changes, many socio-economic and environmental drawbacks exist. The number of hazards has been rising due to Arctic changes, including coastal flooding and erosion, damage to buildings, risks of avalanches and floods from rapid Arctic glacier melting, wildfires, and landslides related to thawing permafrost. Furthermore, Arctic changes (especially sea-ice loss) may also impact the climate at mid-latitudes, although many uncertainties exist regarding these possible links (see Cohen et al., 2014). Mitigating climate change by decreasing greenhouse gas emissions. Implementing the Paris Agreement would allow stabilizing the Arctic temperatures at 5-9°C above the 1986-2005 average in the latter half of this century. This would also reduce the associated changes identified on our Image of the Week. However, it is recognized that even if we implement the Paris Agreement, the Arctic environment of 2100 would be substantially different than that of today. 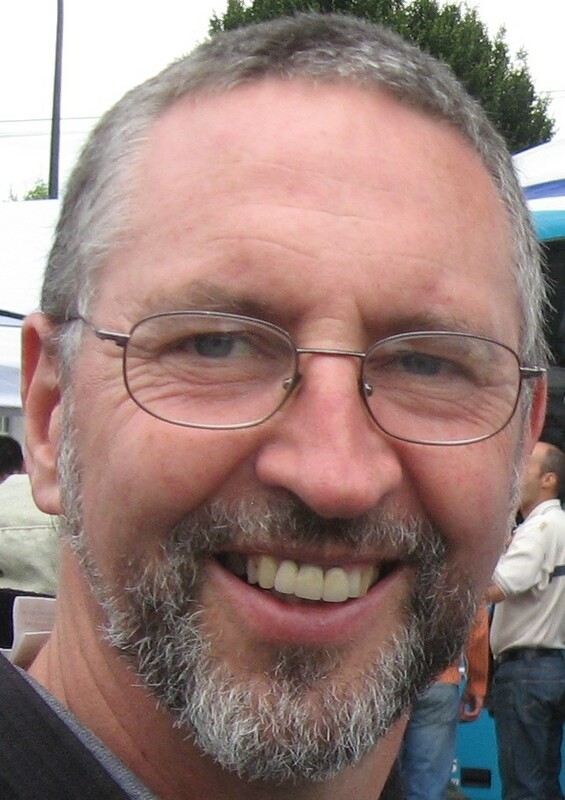 Adapting to impacts caused by Arctic changes. Advancing our understanding of Arctic changes through international collaboration, exchange of knowledge between scientists and the general public, and engagement with stakeholders. Raising public awareness by sharing information about Arctic changes. AMAP (2017). Snow, Water, Ice and Permafrost in the Arctic (SWIPA) 2017. Arctic Monitoring and Assessment Programme (AMAP), Oslo, Norway. xiv + 269 pp. Gloriously cloudless day for the fieldtrip to the Ötztal Alps [Credit: C. Reijmer]. 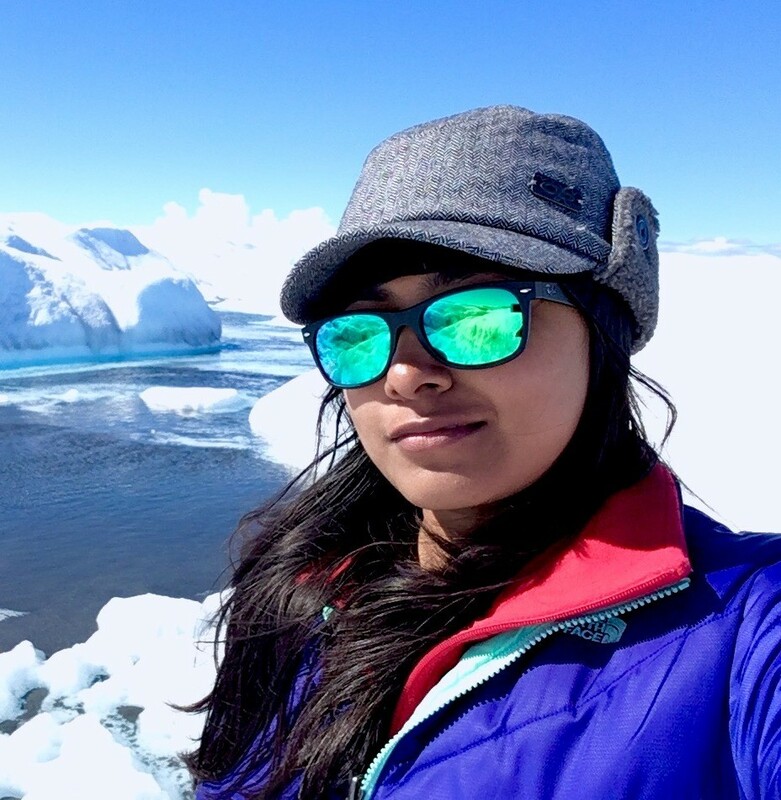 Glaciologists often undertake fieldwork in remote and difficult to access locations, which perhaps explains why they happily travel to similar locations to attend meetings and workshops. The Karthaus Summer School, which focuses on Ice Sheets and Glaciers in the Climate System, is no exception. 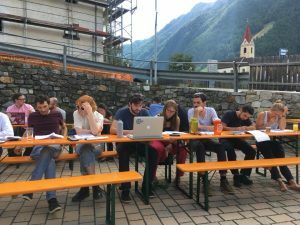 The idyllic village of Karthaus, located in the narrow Schnalstal valley in Südtirol (Italy), has been hosting this 10-day glaciology course nearly every year since 1995. In September, an international crowd of some 30+ PhD students and postdocs, and 11 lecturers assembled in Karthaus for the 2017 edition of this famous course, for an intensive program of lectures, food, some science, more food (with wine! ), and lots of socialising. 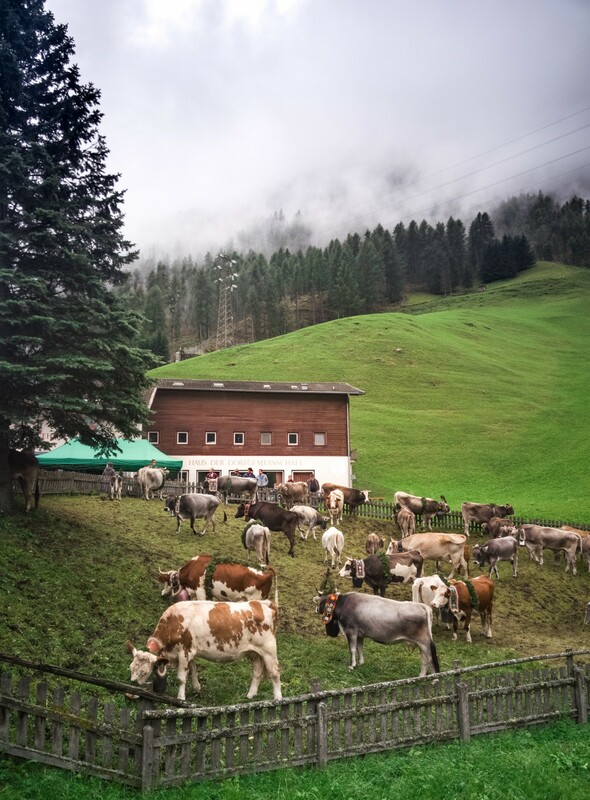 The lecture theatre with a backdrop of green hills, on the day the cows came down from the hills [Credit: D. Medrzycka]. A typical morning of the course involved four hours of lectures, which covered a wide range of topics including continuum mechanics, thermodynamics, ice-ocean interactions, ice cores, geophysics, and geodynamics, with a special focus on numerical modelling and its applications for investigating ice-climate interactions. The lectures covered fundamentals processes, their applications and limitations, and current knowledge gaps for a wide range of complex concepts related to ice dynamics. All our lecturers happily answered our (many) additional questions during the coffee and cake breaks, enjoyed in the fresh mountain air outside the lecture theatre. 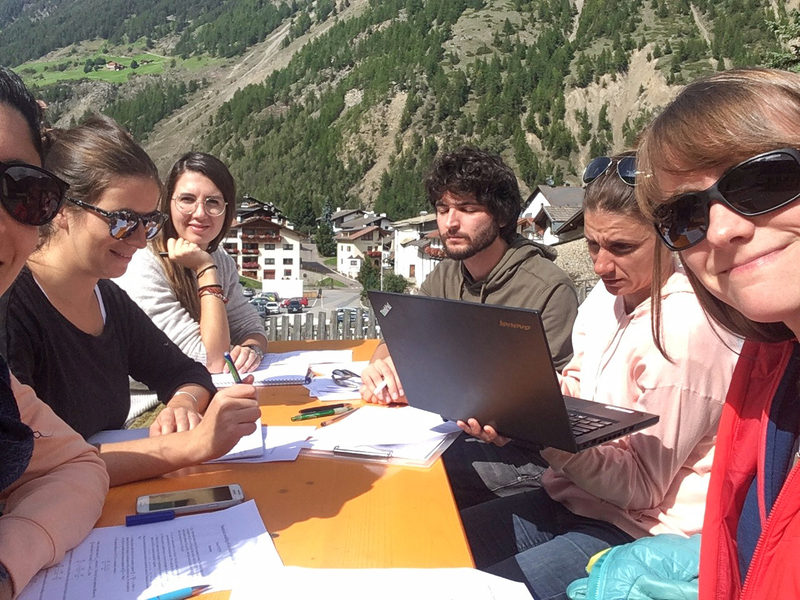 The biggest challenge was not the group work itself, but trying to not get distracted by the sun and the hills surrounding us [Credit: V. Zorzut]. After a three-course lunch, we spent the afternoon sessions applying the theory learned in the morning lectures. The group projects were designed to get us to go into more detail on certain topics, and work on real-world applications for specific research problems. We presented the results of our work at the end of the course during a 15 minute group presentation. For those who could afford a bit of free time after these sessions, the rest of the afternoon could be spent either hiking or trail running in the steep hills overlooking the village (trying to beat I. Hewitt’s time up Kruezspitze), playing football, chilling in the sauna, or catching up on some sleep before dinner. Everyone who has ever attended the Karthaus course mentions the food, complementing both the quality and (legendary) quantity of it. 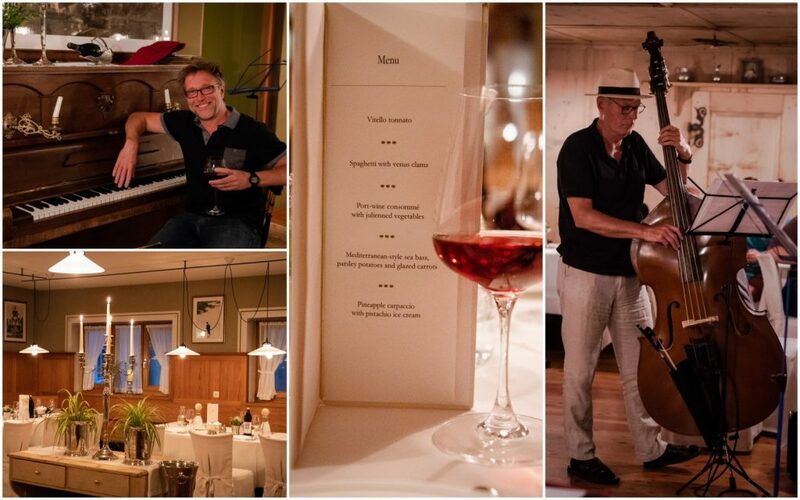 Every evening, we were served a memorable five course meal accompanied by generous amounts of local wine. Dessert was followed by musical entertainment, with inspired performances by Frank Pattyn on the piano. On the last evening, Frank was accompanied by Johannes Oerlemans who treated us to two of his original tango arrangements on the guitar, followed by a passionate rendition of Jacques Brel’s Le port d’Amsterdam by our own Kevin Bulthuis (vocals). 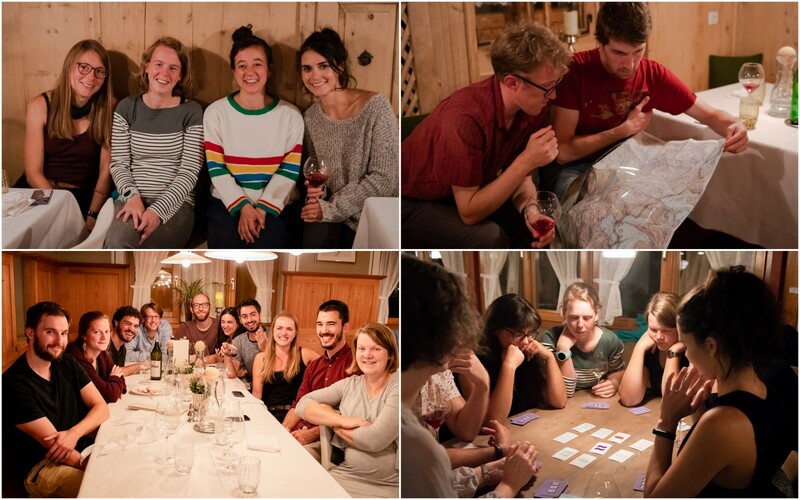 We wrapped up each day of the course in the local bar, socialising, playing card games, sampling the local beers, and making our way through the many different flavours of schnaps and grappa. 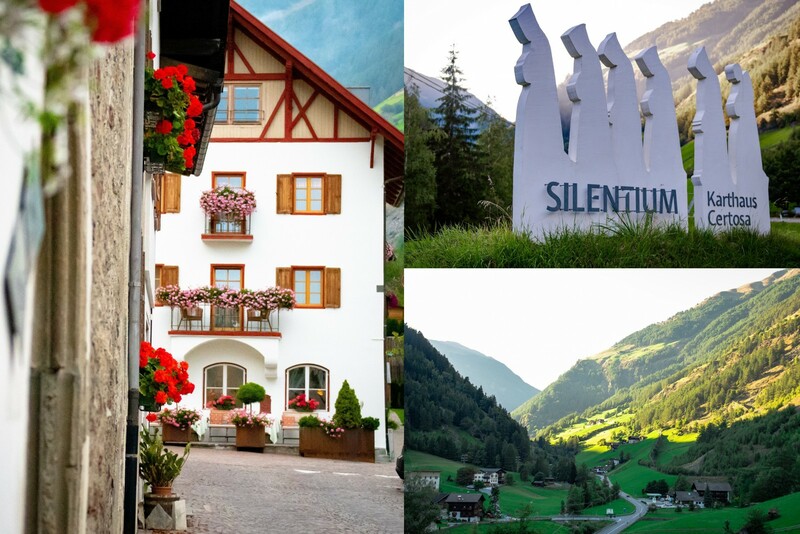 Big thanks to the owners, Paul and Stefania Grüner, and staff (with a special shout-out to Hannes) of the Goldene Rose Hotel, and the village of Karthaus, for taking great care of us! 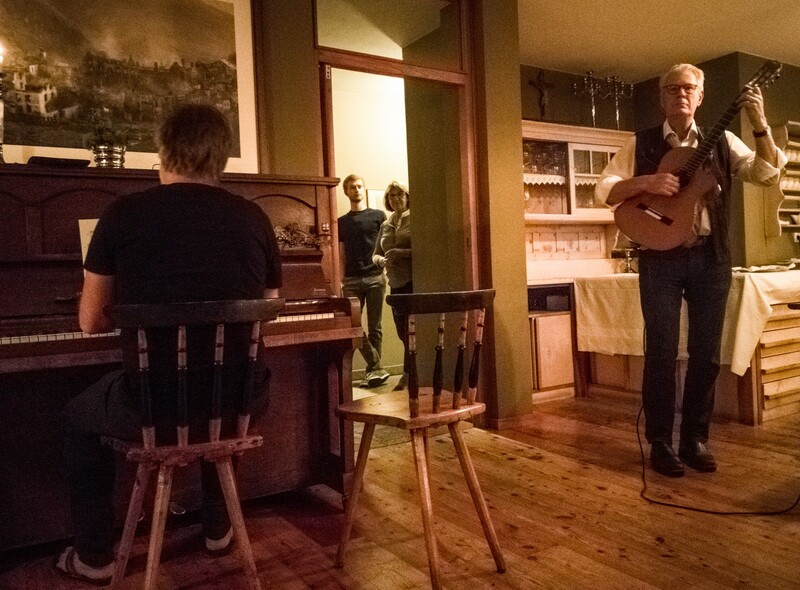 Frank Pattyn (piano) and Johannes Oerlemans (guitar) performing an original tango arrangement [Credit: D. Medrzycka]. 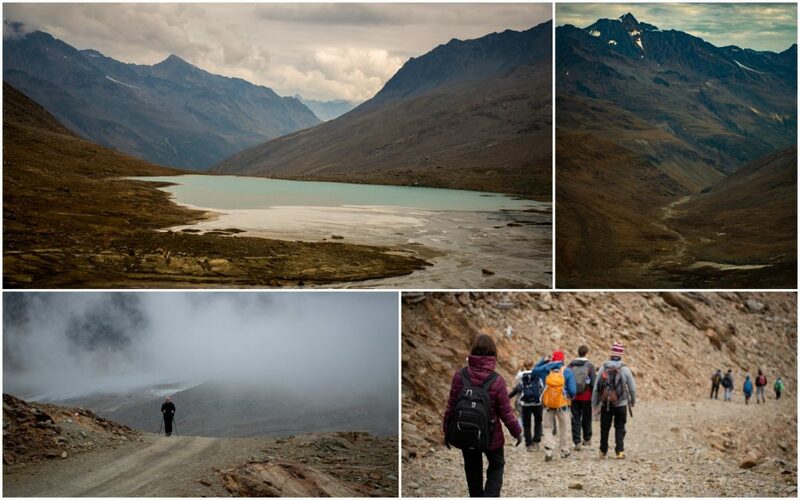 On the penultimate day of the course the group headed to a number of glaciers in the Ötztal Alps. The excursion, which happened to take place on a perfectly cloudless day, gave us the opportunity to observe first hand the changes affecting glaciers in the region, and the impact of these retreating ice masses on the landscape and humans inhabiting it. It also provided a much needed break from the intense week! After walking down the ski slopes of the Hochjochferner, a small valley glacier accessible by cable car from Kurzras, we stopped to enjoy the sun and have lunch at the Schöne Aussicht (Bellavista) hut (2845 m a.s.l.). Those with more energy scrambled up to the ridge running along the Italian/Austrian border (3270 m a.s.l. ), through at times knee-deep snow, to take a peak at the Hintereisferner, a valley glacier on the Austrian side of the border. 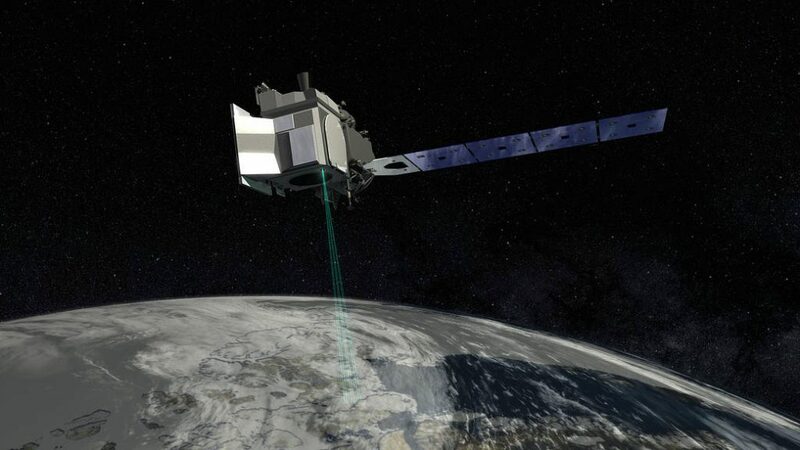 Four of us continued on along the ridge, and by chance visited the laser scanner (LiDAR) system operated by researchers from the University of Innsbruck, used to monitor changes in surface elevation on the glacier. Standing on the ridge running along the Italian/Austrian border. View onto the Hintereisferner [Credit: D. Medrzycka]. The 10 day course was certainly an intensive (and intense) experience, and I would recommend it to all glaciology students without reservations, whether they are looking for a basic introduction to ice dynamics, or aiming to fill a few knowledge gaps. Whilst some of the topics covered in the course were only remotely related to my own PhD research (and far out of my comfort zone! ), the lectures and project work forced me to think in alternate ways. 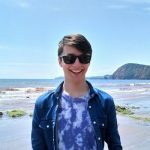 Although I may have finished the course with more questions than I had at the start, I now know where to go look for the answers! A big part of the experience was without a doubt the social aspect of the course. Between the never ending and excellent food (as a result of which some of us developed “food babies”), and the long evenings at the local bar (resulting in increasing amounts of sleep deprivation), there were plenty of opportunities to talk science, gain new insights into our ongoing research, and discuss ideas for future projects. As with all great Summer Schools, one of the major perks was the opportunity to hang out with fellow students, expand our network of fellow researchers, and establish the groundwork for continued professional collaborations. Huge thanks to the convenor, Johannes Oerlemans, the village of Karthaus, and all the lecturers and fellow students for a memorable 10 days! I am looking forward to working with all of you in the future. 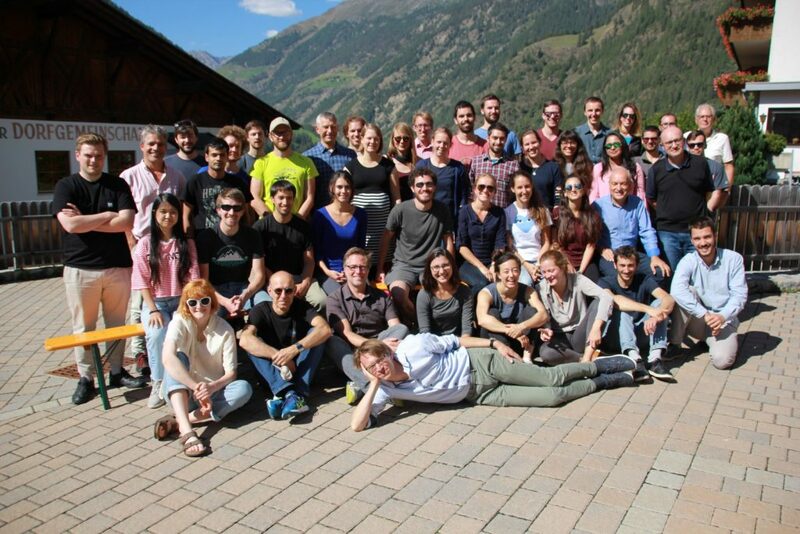 The crowd of the Karthaus summerschool: 2017 edition [Credit: C. Reijmer]. 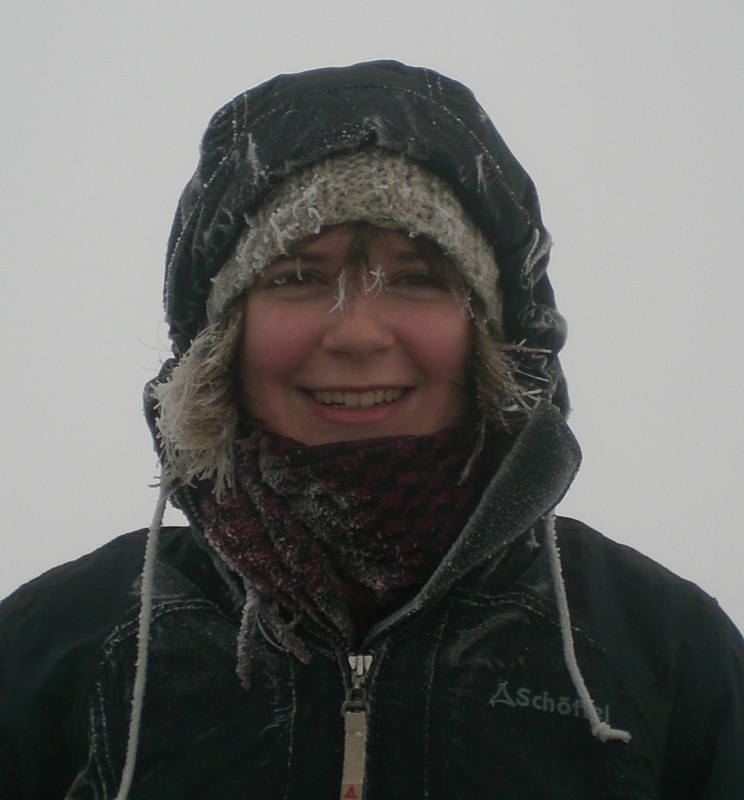 Dorota Medrzycka is a PhD candidate at the University of Ottawa (Canada), working with Luke Copland. 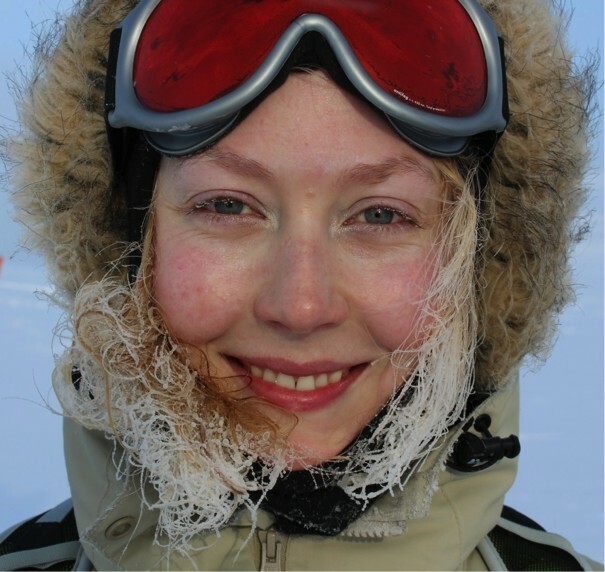 Her research focuses on the dynamics of glaciers and ice caps in the Canadian High Arctic, with a focus on ice flow instabilities (including glacier surging). 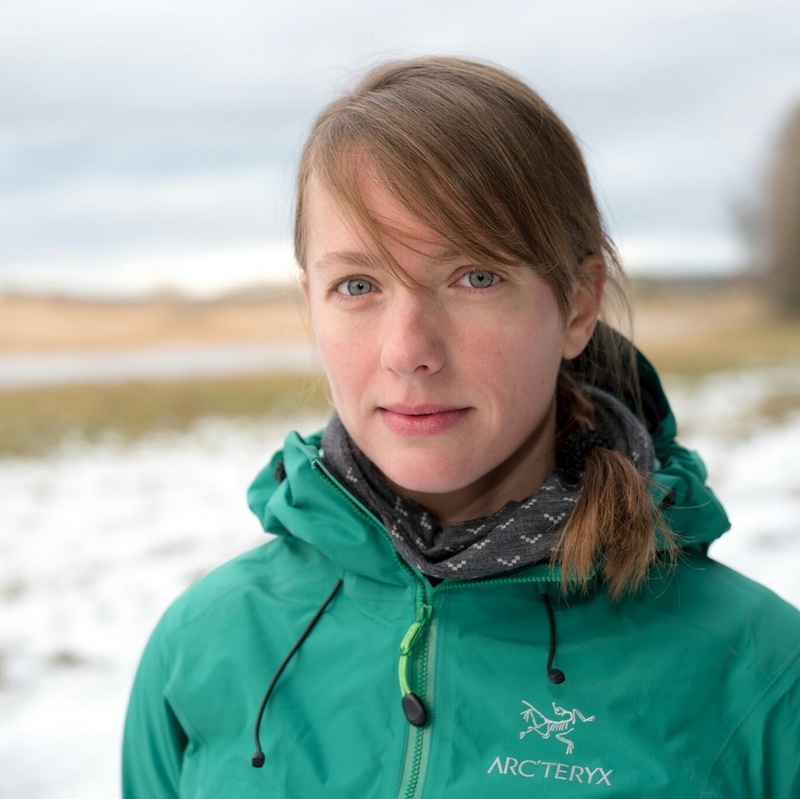 Her project combines field studies and remote sensing techniques to monitor ice motion, and gain insight into the factors controlling the variability in ice dynamics in the Canadian Arctic. Contact: dorota.medrzycka@uottawa.ca. Our image of the week shows the area around the calving front of Petermann Glacier through the spring, summer, and autumn of 2016. Petermann Glacier, in northern Greenland, is one of the largest glaciers of the Greenland Ice Sheet. It terminates in the huge Petermann Fjord, more than 10 km wide, surrounded by 1000 m cliffs and plunging to more than 1100 m below sea level at its deepest point. In 2010 and 2012, the glacier caught the world’s attention with two large events, which caused the glacier to retreat to a historically unprecedented position. In Fig. 1 we see the changes happening through the season on Petermann glacier – and they are huge. The animated map highlights many different processes. As areas emerge from the Polar night at the start of spring, the shadows quickly shorten and the light levels become noticeably higher. This is followed by the melting of the snow, first on south-facing slopes, and eventually to on the high-elevation areas in the mountains. As the sun returns, meltwater starts forming on the surface of the glacier, this is visible as vast turquoise lakes. Finally, the sea ice in the fjord succumbs to the seasonal warming of the ocean and atmosphere, it thins, and then completely disintegrates at around day 205. The change in the glacier is perhaps the most interesting phenomenon. It is possible to observe the glacier flowing and advancing into the fjord. In addition, several large rifts near the front open through the course of the year. These will eventually spread across the front of the glacier and a new, huge iceberg will be born. These rifts are being closely monitored, and it is likely that when the iceberg calves it will bring cause Petermann Glacier to retreat to a new historical minimum. The image above is an example of a new type of map, it takes cartography into the 4th dimension—time. 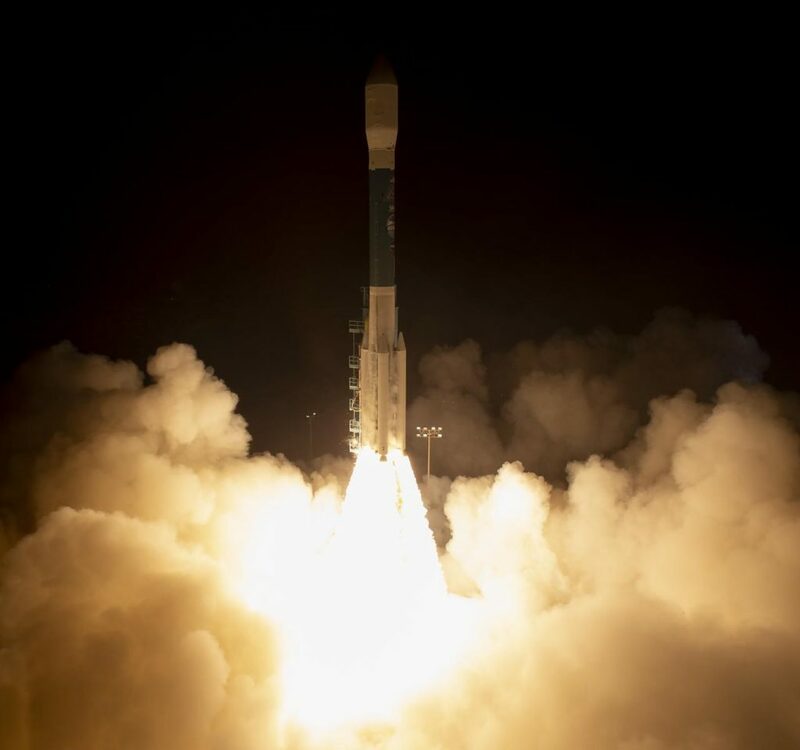 Technological advances have only recently made it possible to create a map like this; with the launch of Landsat 8 and Sentinel-2 it is now possible to receive regular, high-resolution, and free satellite images of high latitude areas. These data have been projected onto a new, high quality digital elevation model (Howat et al., 2013) to create this map. Image of the week – Learning from our past! Figure 1: Peak global mean temperature, atmospheric CO2, maximum global mean sea level (GMSL) and source(s) of meltwater over the past 3 million years. 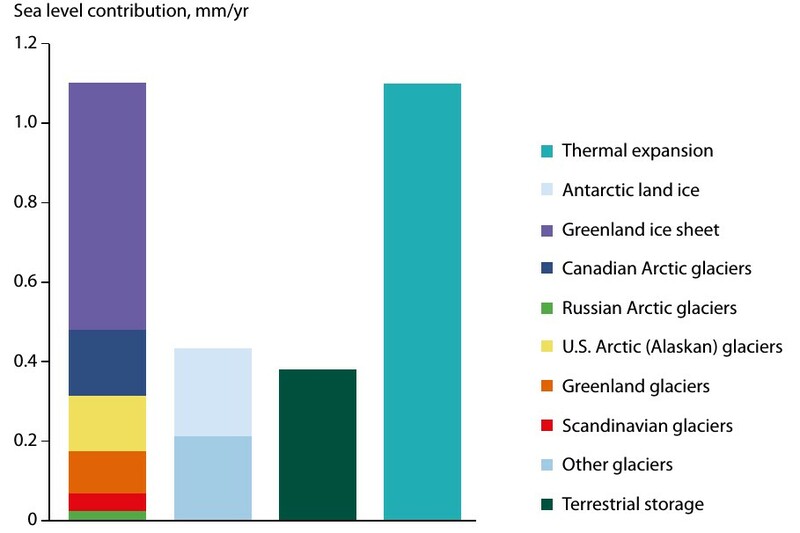 The light blue area on each bar indicates the uncertainty associated with the maximum global mean sea level , and the pie charts denote the fraction (not location) of ice retreat in Greenland and Antarctica [Credit: Dutton et al. (2015)]. Understanding the climate evolution of our planet is not an easy task, but it is essential to understand the past if we are to predict the future! Historic climate cycles provide us with a glimpse into a period of time when the Earth was warmer than it was today. Our image of the week looks at these warmer periods of time to see what they can tell us about the future! For example, during the Pliocene, the global mean sea level was greater than 6 m higher than it is today… so what can these historic records tell us about the future of the ice sheets and their contribution to sea-level rise? We will work forward in time from 3 million years ago to present-day and examine the evidence we have about the past climate of Earth. In this time period there have been cycles of warm and cool climate (glacials and interglacials – see our previous post). Here we will examine those interglacial periods where the climate was warmer than the preindustrial period (before 1750). 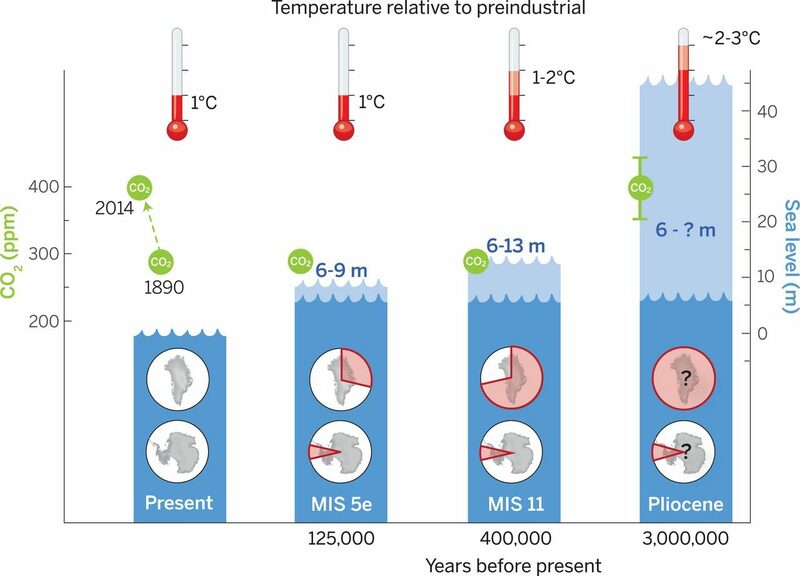 Approximately 3 million years ago during the mid-Pliocene period, the earth experienced climate cycles every 41,000 years, and the atmospheric CO2 ranged from 350 to 450 ppm compared to around 400 ppm today and 250 ppm preindustrial. During the Pliocene period, peak global mean temperatures were on average 1.9ºC to 3.6ºC warmer than preindustrial temperatures. Ice sheet modelers have used these changes in climatic conditions to estimate the retreat of the Antarctic and Greenland ice sheets, which predicted the global mean sea level to rise ~6 and ~7 m, respectively (see our Image of the Week). Others have used geochemical methods to reconstruct historic sea level, which suggest that the global mean sea-level rise was 21 ± 10 m! While these studies provide great reason to be alarmed, they are unfortunately plagued with uncertainty that makes it challenging to provide any robust estimates of future sea-level rise based on the Pliocene period. Fortunately, more data is available from time periods closer to the present. Approximately 400,000 years ago, the earth experienced an unusually long period of warming, where the global mean temperature was estimated to be 1-2ºC warmer than preindustrial levels (see our Image of the Week). This period is known as MIS 11. Historic records such as pollen records, biomolecules, and ice-rafted debris suggest that the Greenland ice sheet severely retreated to the extent that forests developed on Southern Greenland! Ice sheet modelers estimate that this retreat in Greenland could have contributed 4.5 – 6 m to the global mean sea level rise. Paleoshoreline reconstruction at sites across the globe suggests that that the global mean sea level rise was ~6 – 13 m, which supports the large retreat experienced by the Greenland ice sheet and suggests that the Antarctic ice sheet likely experienced significant retreat as well if those higher estimates of sea level rise (~13 m) occurred. Approximately 125,000 years ago, the earth experienced a period of warming approximately 1ºC warmer than preindustrial levels, known as MIS 5e. This warmer period has significantly more data available compared to the other time periods. It is often the case that more recent times have more abundant data and in this caseshorelines that developed during MIS 5e provide an excellent record of global mean sea level being an estimated 6 – 9 m higher than present. 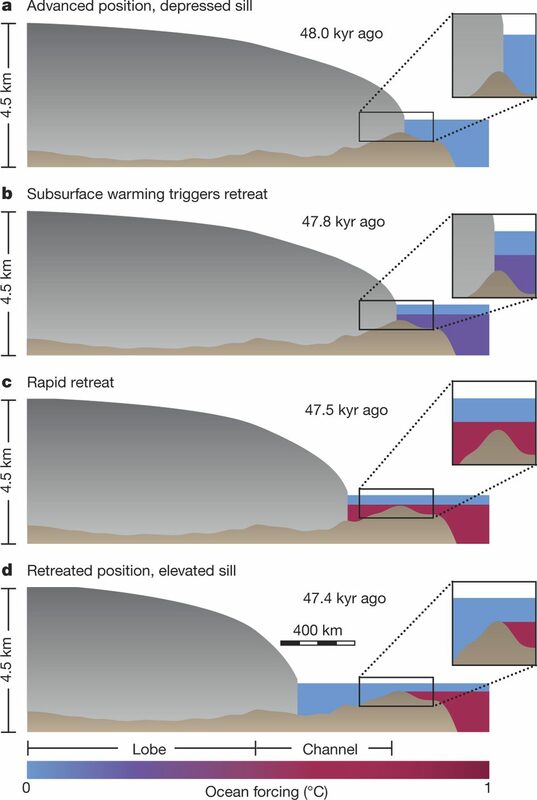 Modeling studies suggest that at this time 0.6 – 3.5 m of sea level rise can be attributed to the retreat of the Greenland ice sheet and ~1 m can be attributed to thermal expansion and the melt of mountain glaciers (see Figure 2). Therefore, despite a lack of mass loss records of the Antarctic ice sheet at this time , it is likely that it underwent considerable retreat to enable contributing to the additional sea level rise. 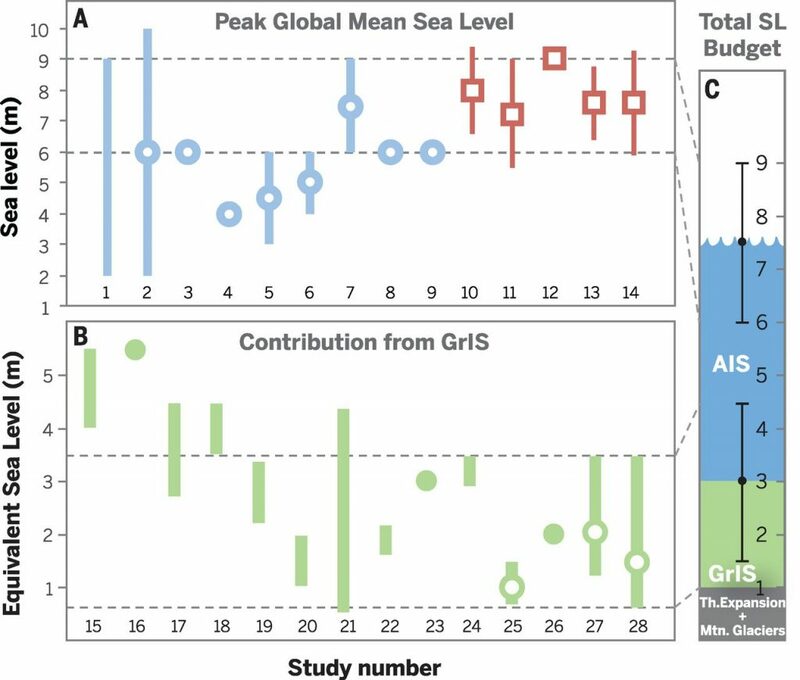 Figure 2: Compilation of MIS 5e reconstructions for peak GMSL, the Greenland ice sheet contribution, and bets estimate of the total sea level budget [Credit: Dutton et al. (2015)]. The further back in time, the larger the sources of uncertainty. Hence, there is fairly limited data regarding the Pliocene that may be used to help predict future conditions. Additionally, it’s important to remember that the climatic cycles in the Earth’s history resulted largely from changes in the Earth’s orbit. This is why the CO2 level associated with MIS 5e and 11 are similar to preindustrial levels, and yet these periods experienced significant increases in global mean temperature accompanied by rises in the global mean sea-level. what we do know from the past is that both ice sheets experienced significant mass loss during these warm periods that directly impacted sea-level rise. Today, the CO2 concentrations are around 407 ppm and the peak global mean temperature is approximately 1ºC warmer than preindustrial times (see the Image of the Week). For reference, the Paris Climate Accord is trying to bring our world leaders together to keep the peak global mean temperatures lower than 2ºC above pre-industrial levels. While the cause of the warming periods might be different, what we do know from the past is that both ice sheets experienced significant mass loss during these warm periods that directly impacted sea-level rise. 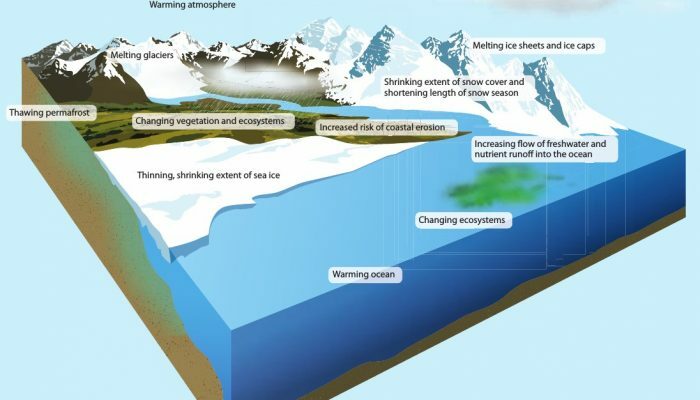 Therefore, it’s very important to monitor and improve our future projections of mass loss from these ice sheets in order to better understand how sea-level rise will affect us. Image of The Week – The Pulsating Ice Sheet! 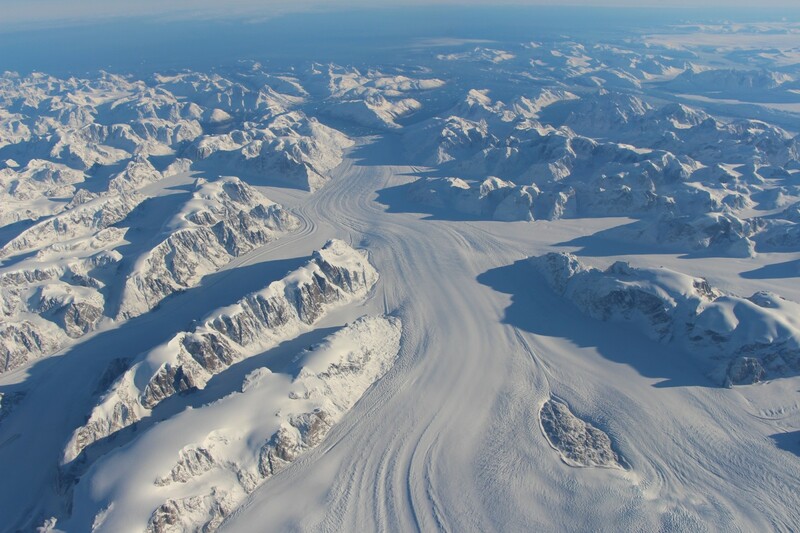 During the last glacial period (~110,000-12,500 years ago) the Laurentide Ice Sheet (North America) experienced rapid, episodic, mass loss events – known as Heinrich events. These events are particularly curious as they occurred during the colder portions of the last glacial period, when we would intuitively expect large-scale mass loss during warmer times. In order to understand mass loss mechanisms from present-day ice sheets we need to understand what happened in the past. So, how can we better explain Heinrich events? During a Heinrich event large swarms of icebergs were discharged from the Laurentide Ice Sheet into the Hudson Strait and eventually into the North Atlantic Ocean. This addition of fresh water to the oceans caused a rise in sea level and a change in ocean currents and therefore climate. We know about these events by studying glacial debris that was transported from the ice sheet into the oceans by the icebergs and eventually deposited on the ocean floor. From studying ocean-sediment records we know that Heinrich events occurred episodically during the last glacial period but not on at a regular intervals. Interestingly, when compared to temperature records from Greenland ice cores, it can be seen that the timing of Heinrich events coincides with the cold phases of Dansgaard–Oeschger (DO) cycles – rapid temperature fluctuations which occurred during the last glacial period (see our previous post). What do we think causes them? a) Ice sheet at it’s full extent, grounded on a sill (raised portion of the bed, at the mouth of the Hudson Strait). Notice the sill is around 300m below sea level at this time. b) A pulse of sub-surface water (purple) warms by a few degrees, encouraging iceberg calving at the glacier front and causing the ice begin to retreat from the sill. c) As the ice retreats, it becomes unstable due to an inwards sloping bed (see our previous post on MISI). This leads to sudden rapid retreat of the ice – characteristic of Heinrich events. d) Due to ice loss and thus less mass depressing the bed, the bed will slowly rise (Glacial Isostatic Adjustment), eventually the sill has risen to a level which cuts off the warmer water from the ice front and the ice can slowly advance again. Once the ice has advanced back to it’s maximum extent (a) it will slowly depress the bed again, allowing deeper, warmer water to reach the ice front and the whole cycle repeats! The authors of this study used this model to simulate Heinrich events over the last glacial period and were able to accurately predict the timing of Heinrich events, as known from ocean sediment records. Check out this video to see the model in action!! This study shows that the proposed mechanism probably controlled the onset of rapid mass-loss Heinrich events in the past and more generally that such mechanisms can cause the rapid retreat of marine terminating glaciers. 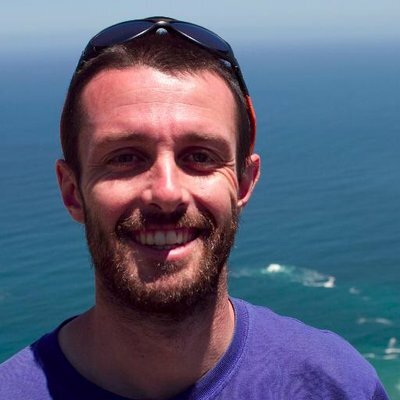 This is important as it adds to our understanding of the stability (or instability) of present day marine terminating glaciers – such as the West Antarctic Ice Sheet! If such rapid mass loss happened regularly in the past we need to know if and how it might happen in the future! such mechanisms can cause the rapid retreat of marine terminating glaciers.